Preheat the oven to 180°C and grease 4 individual pie dishes. Place the butter in a saucepan over medium heat. Add the leek and cook, stirring, for 5 minutes or until softened. Add the mushrooms and ginger, and cook for a further minute. Stir in the flour, then gradually add the stock. Reduce the heat to low and cook, stirring, for 1-2 minutes until the sauce has thickened. Stir in the frozen peas, cooked chicken, ham and coriander. Season with salt, pepper and a pinch five spice powder. Stir in the cream, then remove from the heat and allow to cool while you prepare the pastry. Cut each pastry sheet into 4 squares. Line each pie tin with one square, pressing well to the sides. Divide the filling among the pie cases. Brush the edges of the pastry with a little water, then top with the remaining pastry. Trim the edges and crimp with your fingers to seal. You can use any pastry trimmings to decorate the tops of the pies if desired. Brush the tops of the pies with beaten egg, then sprinkle with sesame seeds. 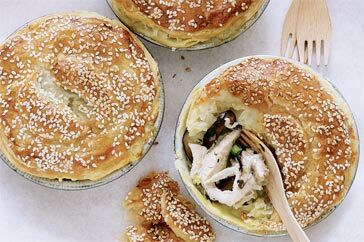 Place pie dishes on a tray in the oven and bake for 20 minutes or until the pastry is golden and puffed. Serve the pies with a mixed leaf salad.